When you meet Ed you are left not *entirely* sure how old he is. He bounces into rooms, his grin is infectious, his hug all enveloping. There is a pinch of Professor, a shot of Perpetual Student, a dash of role player, an air of jolly good chap in a plaid shirt… None of these would be completely wrong. He’s been ‘around fantasy’, including spells as a reviewer, and yet his entry onto the scene (in 2013) carries all the hallmarks of ‘overnight sensation’ and thus you expect him to be in his 20’s or (giving him dues for holding a masters degree, and having been a lecturer in a university) possibly his early 30’s. He isn’t. He’s also quite guarded and holds his life close to his chest, albeit in an utterly charming way. Listening back to our interview, I realise that he has just as much interviewed me, as I him. On meeting, you feel you already know him, so effective is he at giving a broad overview of his writing life; with shared photographs of the little pieces of nature left as keyboard gifts, or the desk built of crates in the garage, and the signing selfies. Tiny glimpses of his family and other connections, peeking through like the flakes in a Rockhampton riverpan. These could be but a wonderful misdirect, to stop you looking too closely; but are, I suspect, simply him being proud partner, dad, and everyman. Why The Relic Guild? How did you come to choose to write Fantasy, and to set it in such an enclosed environment? Well, the idea was actually one I had when I was going into my masters degree. I knew I was going to be writing fantasy so I pitched this idea to my supervisor. The version I wrote for the masters degree was very different from the version that Gollancz published. It was more an academic, experimental road that I went down, which turned out a very interesting book of ideas, but not what you could call a commercial story. But it also had the landscape, and it had the characters, and it had all this data to build on. I knew that I wasn’t going to be doing medieval fantasy, though I love it and will continue to read it ’til the day i die. For me, as a writer, you need to be invested in the idea you’ve got. You set your terms, you’ve set your lights; roll cameras and action type of thing. Once you feel you’ve got that in place then the story can be told. So I had this odd place which is heavily inspired by the medieval fantasies I’ve read, but isn’t set in that environment. I’m interested that you say your original piece was more experimental. Even though its explicitly fantasy, there’s lots of science fiction elements. It has technology. What I wanted to do was give the main location of Labrys Town that feeling of stagnation. So I gave it a certain point of development, the trams and just the everyday things like showers. So that it has recognisable elements, but they’ve reached the stage where there was no point in going beyond; where you had the feeling it could go further, into flight, that kind of thing. A representation of the whole human race living inside this small place. But back to the idea of the technology. 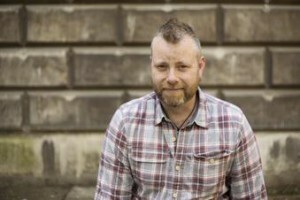 When the book was first signed my editor (Marcus Gipps) and I were talking about what was in the book, and one of the things he felt needed changing was, that I had gunpowder. Guns in that version of the book were just normal. But before I’d done that, I‘d had the system of the power stones; little bursts of magic that propel the bullets. I took it out because i felt like having gunpowder streamlined everything it meant that there was less to explain. Talking to Marcus, he said that the idea of gunpowder pushes it a little bit more towards that steampunk area, or science fiction. So maybe you can have a different system? I said ‘yeah no problem’ and went back to the system I’d cut from the book, and it was literally a case of cutting and pasting it back into the story. I’m glad I did that, because I was able to open up the idea, going into the second book, that the power stones energise a lot of things in Labrys Town. So yes, technology. Its funny you say that, and I immediately think ‘science fiction’ but its not science fiction its just technology with magic instead. Are you very much a product of the computer age? <laughs> no. I really wish my wife was here to hear you ask me that question, because she’d be rolling around the floor laughing. No. I had a smart phone for, maybe even 2 years before I really realised what it could do. now i do know, I find it quite handy, The smart phone and the ipad, are easier for me to use than the computer. I just find them more user friendly. I’ve got writing programmes on the ipad as well; if I had to get rid of the computer I’d not miss that, as much as i would miss having a smart device. So how do they fit into your process? When I first started writing, I was using typewriters. I’ve still got it, Its about 100 years old. A Remington Portable, because it comes in its own case. This thing is made out of cast iron. Its so heavy that the full stop key is a hole punch, it just smacks a hole in the paper. I love it and still use it, I’m still going back to that, and; I still write in long hand. I write this in notebooks as well and so far I must have about 25 at least notebooks, filled with notes, going back to that original book (the MA project). Everything ends up going on to the computer in the end, because I find that, what they do, are fantastic for, is self editing. reading through things, changing things. I don’t need to re write a whole page just to change stuff. So would you say that you have all the copy in the book in those little books, and that the book is basically a distillation? If not in writing style, you would certainly get it in direction. They could totally ruin the story for people …But Everything you *need* to know about the story is in the first book anyway. (My) Notebooks are also a writing exercise, so very often they don’t read well, or they don’t make sense because if I’m struggling to get going I will just write until it warms up, so it might be two pages of crap before anything decent comes out. Now on Twitter, you often mention ‘Dark Ed’, what is that about? <laughs> Dark Ed. That’s Gillian Redfearn’s fault. You can quote me on that as well! It was at York (FantasyCon 2014). Gillian was joking that she was going to develop dark Ed; Bring him out. I think there is, in certain quarters, a genuine concern that I’m going to get eaten alive. in publishing. maybe that’s true. I don’t know. But I love Gillian, I love Marcus, I love Simon. They’re a great bunch. Do you think its because you’ve been an academic? No I think its because I’m naive. And I like being naive. I would prefer to always give people a chance and then be disappointed. I’ve been cynical. I’ve been to bad places. I prefer not to be there. So if somebody wounds me. I would prefer that to be, to have been as a result of me being willing to trust the human race. Maybe its (raises an eyebrow) because I look so youthful, but you know, I’m 44. You don’t get to that age, to that stage, without having learnt to fly a little bit, otherwise I’d have just fallen out of the nest. Why did you leave the first book where you did? Why did you choose that point? Actually, I didn’t choose that point. My editor, Marcus, said ‘I think *this* is a better point to leave the story’. There was one scene that got taken out of the first book, that is now chapter one of the second. In hindsight, it was, it was a really good call, because that first scene going into the second book, actually sets book two up in such a way that its like having someone run into the room with a smoke grenade, hurl it, turn round and run out again; and then… chaos! 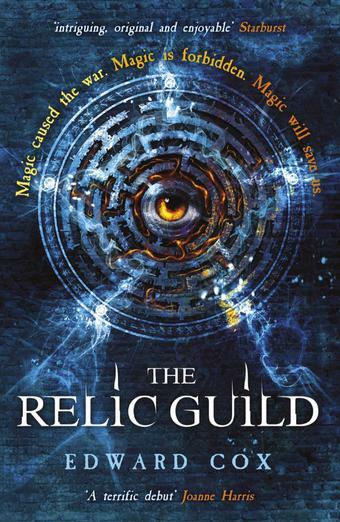 The Relic Guild is published by Gollancz, and is out in paperback from 9th July 2015.